Participants in a workshop on domestic violence in Valle, Honduras. The workshop is intended to show the links between gender, poverty, abuse and disease. 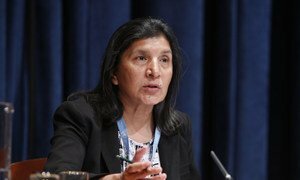 An independent United Nations human rights expert has urged the Government of Honduras to address the culture of widespread impunity for crimes against women and girls, while also noting that incidents of violence against women appear to be on the rise in the Central American nation. An independent United Nations human rights expert has stressed the need to hold States accountable not only for investigating acts of violence against women but also for failing to prevent such violence.